You don't need to worry about missing your step class when you come to Safed. Get your workout by walking up or down the Great Stairs! The stairs run up and down the mountain on which Safed is built and begin at the bottom of the Old City where they meet the Artists Quarter, and run right up to the Midrahov near the top of the city. Start at the parking lot on Keren Hayesod Street in front of the Ha Me'iri Observation Point. Check your city map, which you can get from Safed's tourist information center, if you don't know where this is. 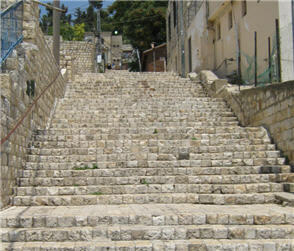 It is located just above the Tayelet: - the stairs that go down to the Ma'or Haim neighborhood at the entrance to Safed. Turn round away from the view and you will see a stone staircase leading up into the city. Start your walk here and continue all the way up the stairs past the main bus park next to the Judith Gallery, until you reach the Midrahov. As you reach the top of the stairs, slightly breathless, look up and directly across the road where you can still see the searchlight and the gun placement slits of the old watchtower built by the British to guard the stairs. The stairs were built by the British to separate the Jewish and Arab quarters (now the Old City and the Artists Quarter respectively) after the riots in 1936. They were heavily guarded and at night a searchlight swept the stairs to make sure no one jumped from quarter to quarter. During the period leading up to and during the War of Independence, to cross from one side of the stairs to the other was to take your life in your hands. It was so dangerous that it became known as Stalingrad Alley, after the Battle of Stalingrad. The stairs are called, in Hebrew, Ma'alot Olei Hagardom, in memory of the members of the Irgun (Stern gang) who were hung by the British in Acco and later buried in Safed after the War of Independence. As you go down these steep stairs why not be adventurous and explore one of the streets that cross the stairs. Off to the right as you walk down, you will find the heart of the Old City and most of the historic synagogues, including the Joseph Caro and the Abhuav Synagogues. Taking the first street, Hatman Sofer, leads you into the Kikar HaMagnim, (the square in the old city) where the Haganah had its secret headquarters in the pre-State period. Further down is Tarpat Street where the main rioting and killings took place during the 1936 riots. This street also leads into the Kikar. When you come down to the main bus park, if you enjoy shopping for all sorts of art and Judaica, go to your right into a covered arcade of galleries and shops. Here you will also find the Joseph Caro synagogue. Below the parking lot is Abuhav Street and its beautiful Sephardi synagogue, the Abuhav, which is well worth the detour. If on the other hand you turn left on Hatam Sofer, immediately as you go down the stairs, you will get back on to the Midrahov. If you continue down as far as the parking lot and then turn left, you will walk right into the Artists Quarter with its delightful lanes and alleys. If you keep going past the Judith Gallery and the General Exhibition, after of course stopping for a browse, you will find yourself on Tet Vav. If you follow this street without being diverted along the way, past the new amphitheater, you will end up by the Ziffer Sculpture Garden and the Ruth Rimonim Hotel. If you want even more of a workout, continue exploring Safed. There are plenty more stairs!